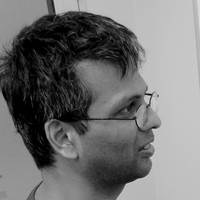 Vishnu Jejjala obtained three Bachelor of Science degrees with honors in Physics, Mathematics, and Astronomy from the University of Maryland 1996. He completed his Masters and Ph.D. in Physics at the University of Illinois in 2002. He subsequently held postdoctoral research appointments at Virginia Tech, Durham University, the Institut des Hautes Études Scientifiques, and Queen Mary, University of London. In October 2011, he was appointed as the NRF/DST Chair in Theoretical Particle Cosmology at the University of the Witwatersrand. He is an Associate Professor in the School of Physics.